Your fireproof racing suit has gotten impossibly filthy, and it needs to be washed. But that terrifies you, because what if you do it wrong and wash away all the fire retardant material and the way you find out that you messed up is when you’re actually on fire. Not to worry, A Clean Person is here for you! In some of my spare time, I engage as a rally co-driver. In rally driving you send a car off into the woods to drive as fast as possible but, since you’re off driving in the middle of the woods and it’s unclear where you’re going, you need a navigator, or co-driver, to tell the driver where to go. So that’s my job. But, since you’re still in a race car, you need all the proper gear: I have to wear this fireproof suit, it’s like a onesie, like a big-old set of pajamas. And since you’re in a car in the woods, not only is it hot, but there’s also times where you get dusty and muddy. It’s an item of clothing that gets a lot of use. I want to wash this, but I’m deathly afraid. If I wash this wrong, the fireproofedness of it will be gone and there won’t be physical evidence of it being gone — I’d wash it wrong, think everything was right, put it back on, crash, get into a fire and burn. That nightmare scenario happened to our own Raphael Orlove, and we were all so fascinated by the idea of Raph setting himself on fire thanks to laundering negligence that we decided this month’s Ask a Clean Person for Jalopnik on the subject. There are all kinds of folklore-y type things you’ll hear about washing fireproof clothing: Use a special detergent! Use any old regular laundry detergent! Dry it in the machine until it’s bone dry! Don’t you dare machine dry it! 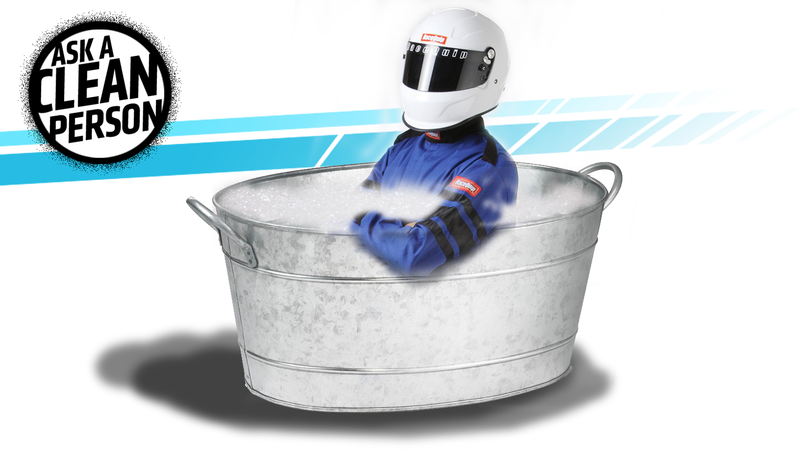 One must only wash a fireproof suit in a cauldron by the light of the Beaver Moon! You can ignore all that folklore. There are, however, a few things to know about washing a fire retardant clothing. The first of which is that you can absolutely do this at home in your washing machine. You may also send the item to the dry cleaner, but if you do that you must (MUST, MUST, MUST!) specify that they’re not to use starch on it. Now that you know that stuff, the rest is mostly gravy! But gravy is good, so here are your best practices when laundering fire retardant clothing: First, check the care instructions for your particular item of clothing to find out what the manufacturer specifies when it comes to water temperature and drying instructions. You’ll also want to turn the clothing inside out before it goes in the washing machine. It’s also important to be mindful of not overusing detergent; more detergent does not equal more clean and, in the case of washing this particular type of garment, it’s really important not to use too large a dose of the stuff. What happens is that the detergent doesn’t get fully rinsed out of the fibers — and lingering detergent can act as an accelerant to flame. So! Please do not use too much detergent. One thing you can use safely is a laundry pretreatment spray, like Shout or Spray ‘n Wash. Which is helpful to know about if your suit has gotten especially soiled during the course of wearing it. When it comes to drying, use a low- or medium-heat drying cycle to prevent shrinking, unless otherwise specified in the care instructions. You may also opt to air dry the item by hanging it or laying it flat. If you’d like to hear me and Raph talking about lighting or not lighting oneself on fire because of faulty laundering practices, we tackled this subject on a recent episode of Ask a Clean Person: The Podcast. 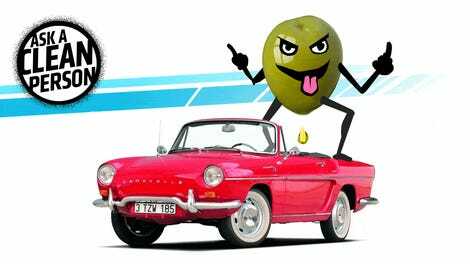 We also spent no small amount of time tormenting Mike Ballaban and Kristen Lee by regaling them with stories of all the terrible food spills that have happened in my listeners cars. Raph and I are a little evil, is the thing. Maybe we deserve to be lit on fire because of faulty laundering practices.